AMSTERDAM-NOIR- Shocking video shows fireman Yellow Vest protestor shot in the back of the head by French police, leaving him with serious brain injuries, as protests against ‘Boy-Macron continue’.Corrupt French Police from Boy Macron deploy semi-automatic weapons, live Ammo Against Yellow Vests and start killing Yellow Vests. 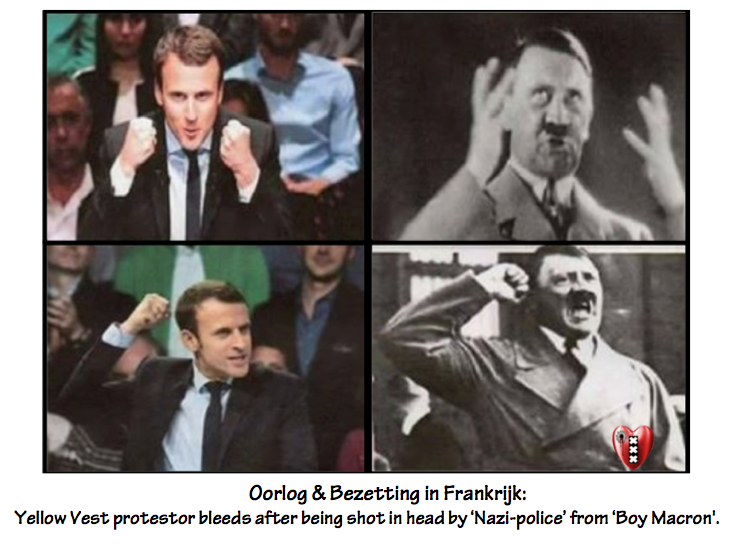 In an unprecedented ‘Nazi& Devil—move’, the corrupt and ‘Yellow (=geel, laf, jaloers)-French -riot police’ from ‘Boy Macron’ the Puppet of the Ultra-Rich have hit the streets with semi-automatic weapons and live ammunition to stop Yellow Vest protesters. Many People call him the Anti Christ. All Hell Breaks loose in France after Yellow Vest Founder arrested by ‘Boy Macorn’ the Anti Christ(Video). Kees van der Spek staat achter de arrestatie. Officers seen carrying German Heckler & Koch G36 assault rifles equipped with 30-cartridge live ammunition magazines were filmed near the Arc de Triomphe monument in Paris on Saturday, showing the extent to which ‘Boy-Macron’ is willing to mete out state violence to secure his ‘plunder the pour- rule’.The move is just the latest sign that the corrupt government of President ‘Boy Macorn ’ is dead-set on deploying every possible repressive ‘Nazi&Devil-measure’ capable of stamping out the dynamic social movement, and comes as the combative protests and seemingly inextinguishable rage of the Gilet Jaunes, or Yellow Vests, approaches its 10th week on the streets of France. 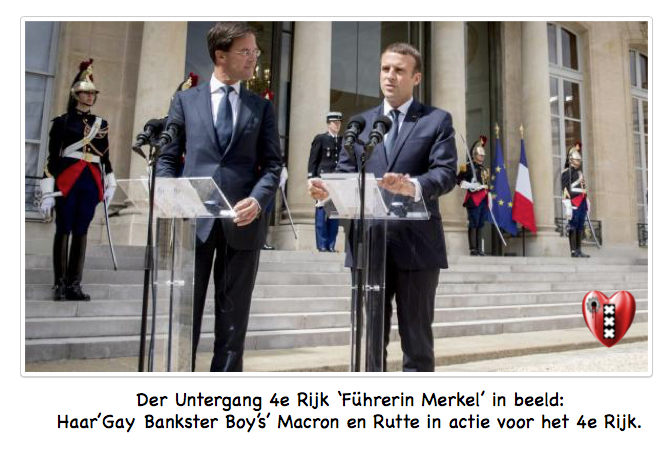 Gele Hesjes gaan Bankrun veroorzaken tot grote Schrik van de Boy’s Macron & Rutte de Puppets van de ‘Ultra-Rijken-Elite-Gangsters’(Video). Happy New Year met Krikke:Boze Scheveninger & Gele Hesjes tegen Krikke: Hebben in een inferno gezeten en we zijn in elkaar geslagen door jou!(Video). The protesters have already won several demands yet they have continued to mobilize unabated for further systemic changes in the country ruled by the corupt ‘Neoliberal- Ultra-right-centrist Nazi&Devil- president’.Yellow Vest protesters have lambasted what they see as the implied threat that they could be sprayed with live ammunition and noted that the weapons were atypical for crowd control units of the French National Police.“The [National Police] with the guns were wearing riot control helmets and body armor – they were not a specialized firearms unit,” protester Gillet Caron said.“Their job was simply to threaten us with lethal weapons in a manner which is very troubling. We deserve some explanations.”The G36 is a common rifle in NATO countries’ militaries and is more commonly used by the specialized squadrons of the police and anti-criminal brigades in France, who are the equivalent of the special weapons and tactics or SWAT teams among their ‘US-Killer-Elite’ ‘Mass-Killing- police’ counterparts.The deployment of the assault rifles comes after conservative former corrupt ‘Elite-Gangsters minister- Psycho- Luc Ferry’ demanded that the state be given more largesse to use extraordinary measures and decisively rub out the Yellow Vest movement. The former ‘dr. 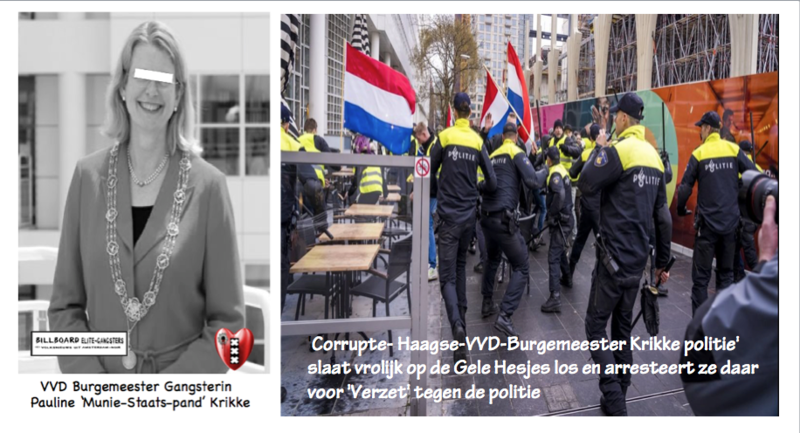 Goebbels-education- minister’ told reporters last week:“What I don’t understand is that we don’t give the means to the police to put an end to this violence.”When told that the guns would lead to grievous injuries or worse among protesters, Ferry responded:“So what? Frankly, when you see guys beating up an unfortunate policeman on the floor, that’s when they should use their weapons once and for all. That’s enough!”The French National Police, known by their French acronym CRS, has already earned widespread revilement for their heavy-handed use of plainclothes officers and excessive use of less-lethal weaponry including tear gas canisters, stun grenades and flash-ball projectiles.On Saturday’s Day of Rage, which marked the 9th consecutive week of protests, fireman and father of three Olivier Beziade was yellow (=geel, laf, jaloers)- shot in the back of the head by corrupt ‘Nazi-police officers’ as he participated in demonstrations while wearing the high-visibility jacket associated with the movement. Beziade is now in a medically-induced coma after suffering a grievous brain injury from the flash-ball and may have lifelong complications due to the blow.According to his wife Cindy, Beziade was trying to escape clouds of teargas before the police appeared around a corner and began firing at fleeing protesters.“They shot at us like rabbits,” she said. Die Burgemeester Krikke vondt het kennelijk belangrijker om een paar gele hesjes te treiteren en in elkaar te laten slaan, dan om de veiligheid van heel Scheveningen te garanderen tegen idioterie van vreugdevuren in de hoogte op het strand met windkracht 8. De echtgenoot van mw. Krikke zat (en zit?) in de verdovende middelen handel. Zij (Pauline en man Miltenburg) geven dus het goede voorbeeld voor de burgers? De gele hesjes zijn nog maar het begin. Want ook Mark Rutte zal straks het leger moeten inzetten om zijn eigen positie hier als minister- president te kunnen handhaven. En hij zal daarnaast nog de Rothschild bankiers vragen om meer geld. De steun van de Amerikaanse CIA zal Mark Rutte hard nodig hebben om de op handen zijnde opstanden zoals die nu in Parijs te zien zijn te kop in te drukken. Macron kan gehele bestuur wel op zijn buik schrijven, daar trappen gele hesjes niet meer in?